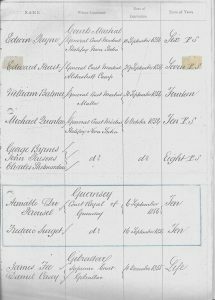 February 6, 1858: Today, we commemorate the 160th anniversary of when Mr John Bower, Surgeon Superintendent, and Mr Thomas Hybert, Sea Captain, proceeded to Deptford Dockyard, near London, having been appointed to take command of the Hired Convict Ship, ‘LORD RAGLAN’. They were assigned to transport 270 male convicts and 84 passengers, consisting of pensioner guards, their wives and children, to the Swan River Colony. My French great-grandfather, Aimable Ciril Dupérouzel, (4840), aged 28 years, from Saint Aubin-du-Perron, in the French Department of Manche and his friend, Frédéric Surget, (4841), aged 44 years, also from Manche, were part of the consignment having been convicted of theft and sentenced to 10-year’s transportation in the Royal Court, St Peter Port, Guernsey, Channel Islands in Sept’ 1856. Aimable’s wife, Elizabeth Susanne Dupérouzel, known as Betsy, was left behind in Guernsey as was Frédéric’s wife, Virginie Louise and their 7 children, all under the age of fifteen. Did you have an ancestor who was on the ‘LORD RAGLAN’? Do you have a convict ancestor of French origin who was transported to Western Australia? 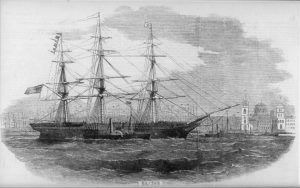 The 756-ton ship was built in Cardiff in 1854 and was adapted at Deptford to ensure sufficient provision was made to enable complete segregation of the convicts from the crew, the officers and their wives and children. The first 60 convicts from Chatham prison embarked at Sheerness on February 19. A few days later 65 more convicts from Portsmouth Prison, including Aimable and Frédéric, embarked at Cowes, having come from the nearby Portsmouth Prison. Fortunately for them they never endured the dreaded purgatory of being confined on a Prison Hulk as the last known prison hulk, ‘DEFENCE’, was destroyed by fire when moored at Woolwich, near London, on July 14, 1857. Additional convicts were taken on board at Portland and Plymouth before she sailed for Fremantle on March 5, a non-stop voyage that would take 88-days. John Bower’s day-by-day Journal for the voyage, consisting of 17,915 words and statistics, for the period Feb’ 6, 1858-June 8, 1858, is available to read in its entirety in the book, ‘Petrosellum – A Global History of the Families Dupérouzel / Duperrouzel’ – see Appendix ‘C’. The Journal provides an invaluable historical insight into the daily routine and life on board the ship. This includes a list of prisoners on whom corporal punishment was inflicted; ports at which the convicts were embarked – with statistics and dates; a list of convicts by name, their age, where born, school attended, and whether they could read or write and a note of their progress during the voyage; a summary of convicts by nationality and an account of the number of convicts classed according to their ages and abilities to read and write. Saturday March 13th Ther. 53° Bar. 30.20. Lat. N. 40°4 Long. W. 10°37. Weather squally and showery. Beds & Hammocks kept below it being found impossible to store either on deck so as to keep them dry, the house appropriated for their reception not being water proof or sufficiently large. Washing and other duties performed. Noon. Dinner. 1.15 P.M. Lecture on the approaching Eclipse of the sun and on Eclipses, illustrated by diagrams delivered by Stephen Stout one of the Prisoners and well received by the rest. 2 Issued a gill of wine to each prisoner. Men on deck by Divisions all day; a few petty officers allowed after Supper. 8 under medical treatment-Prison secured after the usual visits. Opened 1 Cask Peas 3-4 no. 37; 1 do Flour no. ; 1 Keg Pepper; 1 Tin Mustard. Irma Walters from Geraldton published a well-illustrated book dedicated to the life of Stephen Montague Stout. The ‘LORD RAGLAN’ arrived at Owen’s Anchorage, Fremantle, on June 1, 1858, with 268 convicts on board having sadly experienced the death of two convicts during the voyage, Mr James Railton and Mr Emanuel Hatchard. It was not until all the formal protocol and procedures had been dealt with that the prisoners were allowed to go ashore seven days later. The crew and their families disembarked the following day. The ‘LORD RAGLAN’ was the twentieth convict ship to arrive in the Swan River Colony between 1850-1868. In total, thirty-seven convict ships transported 9,636 convicts to the Colony, of whom seven were of French origin.